Prineville city councilors like the idea of the Crook County Parks and Recreation Foundation adding a new playground alongside the incoming splash pad. The group gave the organization the informal go-ahead to move forward on raising funds for the project and eventually building the structure, with plans to pass a more formal approval in the near future. Duane Garner, executive director of Crook County Parks and Recreation District, approached the city council Tuesday evening on behalf of the foundation to see if the municipality would be willing to allow the playground on the city land. "The city owns that property," he said of the location at the west end of Stryker Park. "Before we go down this road of fundraising, are you in agreement that this is a good idea? Would you grant permission for this to be done?" The idea for a new playground stems from concerns that the "Castle Park" playground at the east end of Ochoco Creek Park is nearing the end of its shelf life. Garner explained that Playgrounds by Leathers built the structure in 1995 and though the parks district has done a good job of maintaining it over the years, it has reached a point where renovation costs would outweigh the expense of building a new playground. "We were evaluating what we should do with this," Garner said. "We need to come up with a plan. These are not cheap." As a result, Linda Haden, foundation board chair and the one who spearheaded the Castle Park project in the 1990s, launched an effort to add a new playground to town near the incoming splash pad. The foundation paid for Danielle Campbell, a designer from Playgrounds by Leathers, a New York company, to visit Prineville late September to see the site and get ideas from the community. She talked to some Barnes Butte Elementary students on Design Day, Sept. 11, where she found out just what they wanted in a play structure. "We talked to a lot of kids that day and they had every idea under the sun," Garner recalls. Campbell then spent the afternoon creating a potential design using the kids' suggestions, and then presented it to the public that evening. 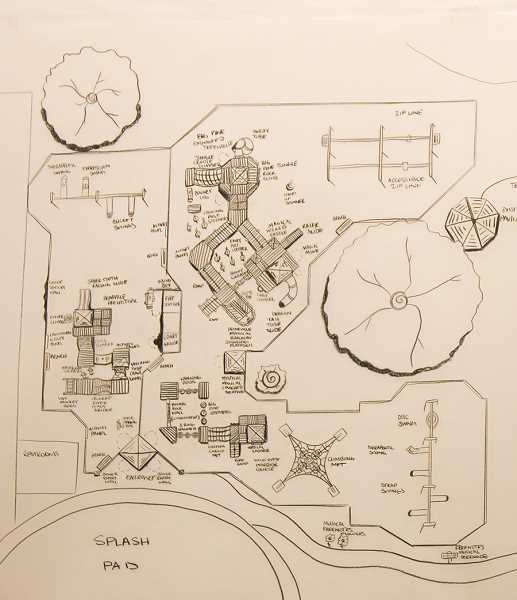 The proposed structure would feature a treehouse, a zip line, and musical instruments. Plans also call for the composite structure to include a fire station, technology area, and a component that pays homage to local history. In his appeal to the council, Garner pointed out that the addition, which would take up most of the west end of Stryker Park, is more than "just a toy." "This is a big vision," he said. "We are looking at this as something that could be a major economic benefit to this community. I think it would draw people from Bend, Redmond and Madras to Prineville to hang out in our park, enjoy our downtown, enjoy our restaurants and experience Prineville." Not only would the construction of the playground require city council approval for use of the land, the foundation would need approval from FEMA to build the structure because the land is part of the local floodplain. Garner has been working with City Planning Director Josh Smith on FEMA approval, and so far, the project has not received written approval, but the agency has offered verbal confirmation that a playground would be allowed on the property. Garner said that the foundation does not yet have any funds for the project, which is estimated to cost more than $500,000, and the organization does not intend to pursue grants or launch any fundraising efforts unless the city has approved eventual construction of a playground on the site. "Personally, I think it would be a good fit for the splash pad and would add to our community," said City Councilor Gail Merritt. Councilor Jeff Papke added that it would be a great amenity to attract people to Prineville's downtown area. "I like the idea," he said. The consensus among councilors prompted a discussion between Garner, City Manager Steve Forrester and City Attorney Jered Reid regarding the best way to formalize the council's approval. Ultimately, Reid opted to draft a resolution spelling out city approval to use the site, with the expectation that a memorandum of understanding would follow if enough funds are raised to move the project forward. The plans and pending approval pleased Garner, who went on to trumpet the location once more. "We have something special here," he said. "When you stand down there next to where the splash pad is being built and look back this direction (south), you see the beautiful city plaza with the bronze horses right in the middle and the courthouse in the backdrop. It's really spectacular."